A couple of months ago I did a speech at the legendary Tweed Heads Business Breakfast – it’s a breakfast that’s been run by John Hurd for an incredible 18 years. John’s made a wonderful contribution to the local business community with his breakfasts – if you’re looking for a very relaxed business with a lovely bunch of people, then head along. Anyway, Brad Fergusson is a Home Loan Centre Manager with RAMS Home Loans at Tweed Heads and heard me speak at the breakfast. He then asked me to come along and speak at a function he was holding. Now, Brad’s a great guy. He’s a guy that’s having a go in life and making a difference. teenage parenting and lots more. Brad’s been so inspired by their great work that he did more than most of us do when we support a charity with a couple of $$$ here and there. He used his charm, good looks and style (cough!) to get 110 or so of his friends and colleagues along to a great night at Twin Towns in Tweed Heads last night to listen to an array of interesting speakers, have a bite to eat and meet some new people. Brad organised raffles, a lucky door prize, donation envelopes and more to raise money for this very worthwhile not for profit organisation. Not because he gets praised. Not because it’s good for business. And not because he gets any benefit. I mentioned this when I was chatting to someone last night – half the battle of life is getting rid of the dickheads who are in your life. You know the sort – the negative, energy draining people who provide zero value to you in terms of kindness and support. The sort of people you want in your life are people like Brad. Good positive people who make a difference to others. And who actually do something. Brad did something last night that makes his community better. Can you make a difference to your community? 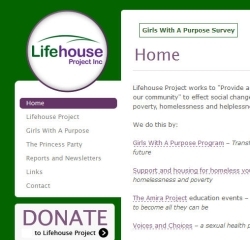 If you want to make a difference to the Lifehouse Project, you can donate here. They do a great job and appreciate all the support they get (not for profit and they receive zero Government funding). Well done Brad. Inspiring stuff what you’ve done.